SAN FRANCISCO, December 31, (THEWILL) – The 2015 Calabar carnival wasn't all fun and games. In line with this year's theme of 'Climate Change', Cross River state Governor, Ben Ayade and his wife, Minister of Transportation, Rotimi Amaechi, Senator Florence Ita Giwa and other dignitaries partook in the 'Plant-a-Tree' march. The tree-planting event is part of the state's campaign to combat climate change issues. 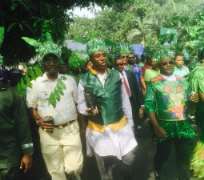 During the march, Governor Ayade who happens to be a Professor of Environmental Science, declared that the entire state, especially its capital – Calabar would go green by the time five million trees are planted across the state. He also expressed hope that tress wouldn't only be planted for fun but to also serve as a means of livelihood for youths who engage in tree planting. With the whole procession decked in green with leaves and the likes, the locals and guests received them amid loud cheers. Check out more pictures from the march below!